Floyd Mayweather Jr and Conor McGregor during their super welterweight boxing match at T-Mobile Arena in Las Vegas. Floyd Mayweather Jr. beat UFC champion Conor McGregor by technical knock out in the 10th round Saturday night, defending his undefeated title, 50-0. McGregor started with an early lead, coming out with energy and landing punches on Mayweather who failed to return any in the early bouts. But Mayweather prevailed in later rounds as McGregor, who was making his boxing debut, tired. 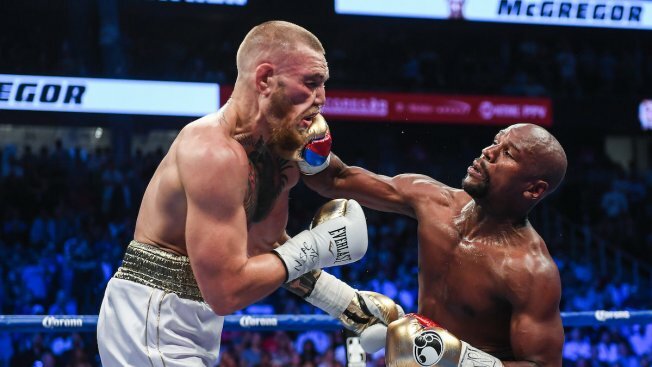 Referee Robert Byrd stopped the fight at 1:05 in the 10th round, deciding McGregor was unable to defend himself any further as Mayweather landed blow after blow. "He's a lot better than I thought he was," Mayweather said of McGregor after the fight. "He's a tough competitor, but I was the better man tonight." Mayweather said that tonight was his last time in the ring "for sure," after coming out of retirement twice before. It was a smashing end to a career that earned Mayweather more money than any fighter before him — including an estimated $200 million for his last bout. McGregor said he disagreed with the Byrd's decision to end the fight, saying that he was tired but still willing to keep going if given the chance. "He's not that fast, he's not that powerful but he's composed," McGregor said of Mayweather after the fight. Though Byrd cautioned McGregor for hitting behind the head on two different occasions, there were no real fouls in the fight and McGregor never tried to revert to any MMA tactics. In a fight so intriguing that it cost $10,000 for ringside seats, McGregor turned in a respectable performance for someone in his first fight. But Mayweather's experience and his ring savvy paid off as he executed his game plan to perfection. Some 50 million people in the U.S. alone were expected to gather with friends and family to see it all unfold. NBC's Shannon Ho contributed to this report.